International competitions in archery are regulated under the rules of the International Archery Federation (FITA). 36 arrows at each distance of 90, 70, 50, 30 meters for men and 70, 60, 50, 30 meters for women. This makes a maximum score of 1440 points. A target face of 122 cm is used for the two longer distances and a face of 80 cm is used for the two shorter distances. 30 arrows at the distances 60, 50, 40 meters for both men and women. The 122 cm face is used for all distances. Indoor archery is shot at the distances 18 and 25 meters. 3D Archery is shot at 3 dimensional animal imitational targets. 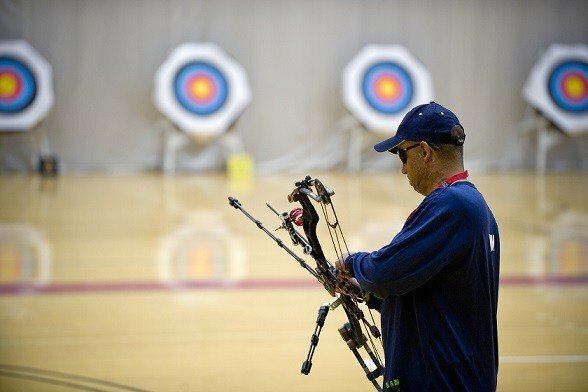 Archery is an ideal sport for people with disabilities. They compete in different categories depending if they sit in a wheelchair or not. Archery is a sport in the Paralympics. Ski Archery is a combination of Archery and Nordic cross-country skiing. Run Archery is a new type of archery competition. It combines cross-country running with archery. Ski-archers often compete in this discipline during the summer. Very simple rules in this discipline: Shoot as long distance as you can. Clout you shoot a long distance and the target zone is on the ground. The Archers first shoot 72 arrows at 70 meters, and the 64 best archers are placed in a match-play ladder. Number one meets number 64 and so on. In the match-play the archers just shoot 12 arrows each match.